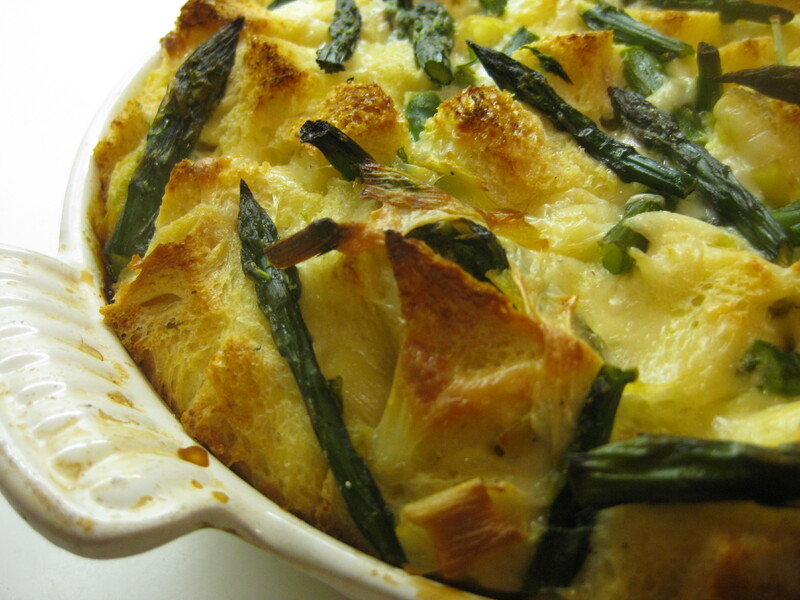 I had lots of asparagus stems left over from canning pickled asparagus, a couple of fat leeks from the farmers’ market and a hunk of stale bread, so on a ridiculously cold and blustery day in May, bread pudding was not only expedient but comforting. I used my typical formula for bread pudding but decreased the bread since I was adding grated fontina cheese and thought the mixture should be custardy. Prepare the main ingredients. If the bread is very moist, dry it out in the oven at 250 degrees for about 15 minutes. Cut it into 1-inch cubes and place in a lightly buttered baking dish (9-inch glass pie plate, 10-inch square glass pan, ceramic baking dish or something equivalent). 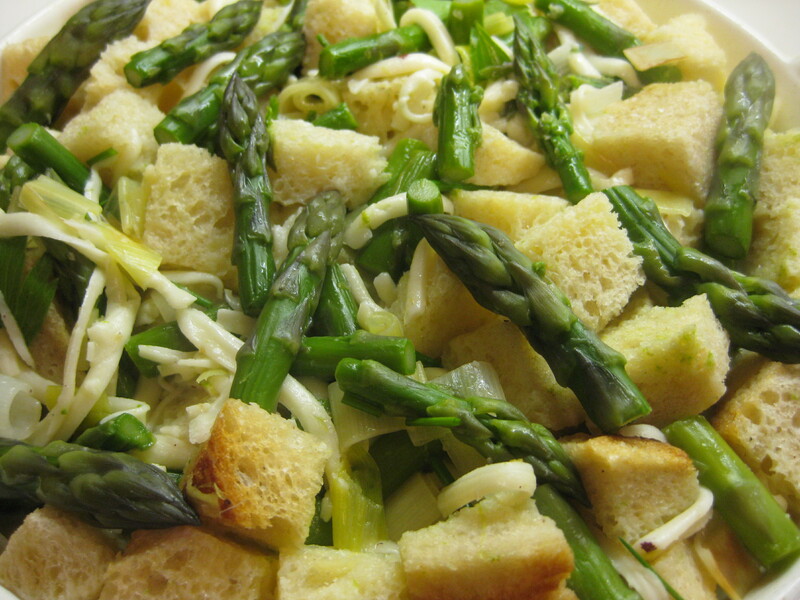 Parboil the asparagus until just tender, drain it, and cut into 1-inch pieces. Braise the leeks slowly in a little water with a dab of butter and a pinch of salt, covered, until tender. There should be no liquid left, but if there is, substitute it for some of the milk. Toss the vegetables with the bread and add the herbs if using. Lightly beat the eggs, combine with the milk and cheese, and pour over the bread mixture, pushing down on the ingredients to absorb the liquid. Let sit for 15-20 minutes or longer. (This can be refrigerated at this point and cooked later.) Preheat the oven to 350 degrees, sprinkle with additional cheese if desired, and bake for about 45 minutes or until the custard is set and the top is browned. Let it stand for a few minutes before serving.